And now let us return to the glorious wilds of Utah! 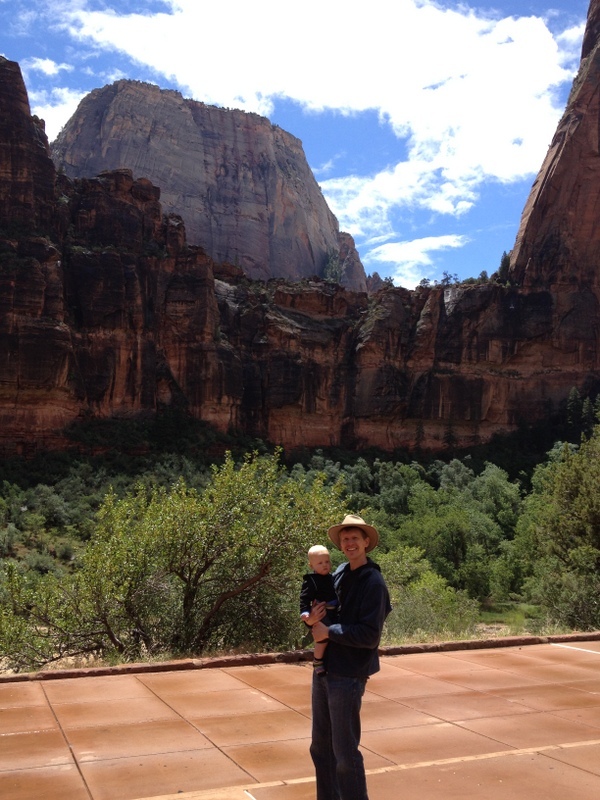 After leaving St. George, we drove to Zion National Park. There was a long line to get in, and I was so excited to see the official sign in the distance. It turns out that, in an unlikely twist for a girl who has never even been on a proper camping trip (but aspires to! ), the National Park System is kind of my Disneyland (where I have also never been!). I like roller coasters as much as the next person, but that arrowhead-shaped marker…it makes my heart sing. Thank you, Teddy Roosevelt, for the parks and for the bears (Micah is a big fan of both). It was an overcast morning, which somehow lent even more gorgeousness to the coral shades of the rocks as we drove in. This was our first time putting Micah in the hiking backpack (thank you, Hillary and Danny! ), so we weren’t sure what he would think. He loved it! He laughed for half of our hike and slept the other half. A small miracle. You can’t see it in these pictures, but we dressed him in his special bear onesie, a gift his godparents got him at Yellowstone, for a little extra National Park love. 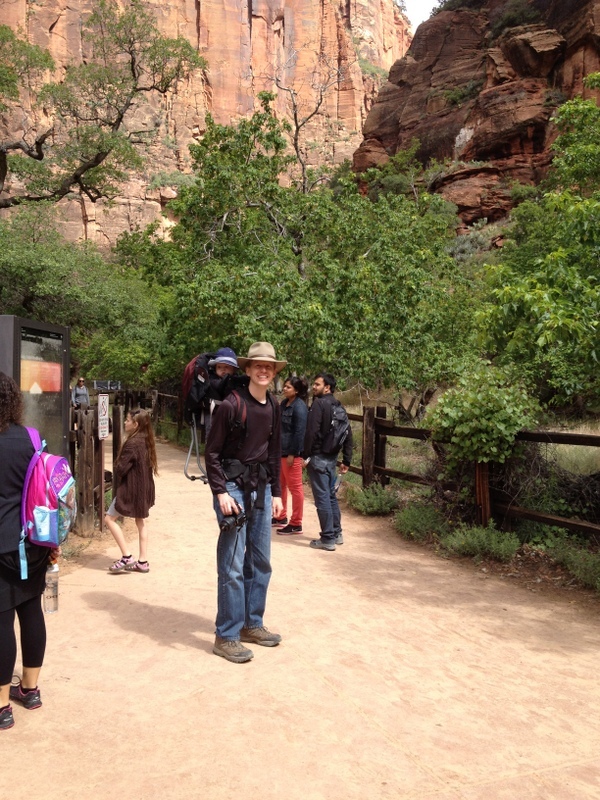 During the peak season at Zion you have to ride a little shuttle bus to the trailheads and other points of interest. It seems like a bit of a bummer, but I really did not mind at all. It was amazing that there were no cars on the park roads, and we never had to wait long for a shuttle (even though the line at the entrance looked frighteningly long). It’s also so much easier for us not to have to get Micah in and out of his carseat. We decided to ride the bus all the way to the last stop, Temple of Sinawava, and explore there first. There is a beautiful trail down to the beginning of The Narrows, where you can actually hike through the Virgin River, gorgeous canyon surrounding you on all sides. You can rent special river shoes and pants to do this, and we weren’t able to pull it off on this trip, but it looked so utterly awesome. My friend Kam (who is also one of the creators of 30 Days of Lists!) recently hiked The Narrows, and I totally encourage you to check our her post and this one, which has just unreal photos. None of mine come close to doing justice to this incredible place. It’s hard to describe how BIG these rocks are. 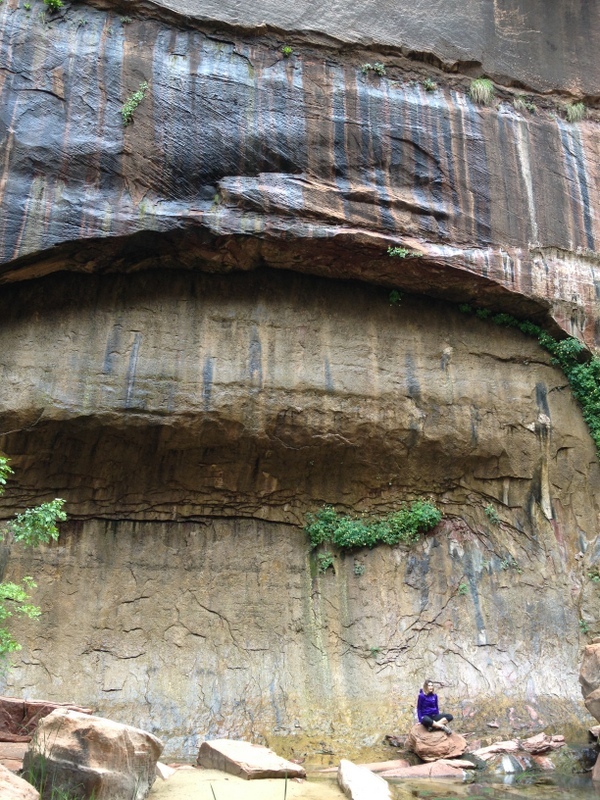 Do you see that tiny-looking person at the bottom of the picture? This rock soared way beyond the top of the picture too. Whoa. 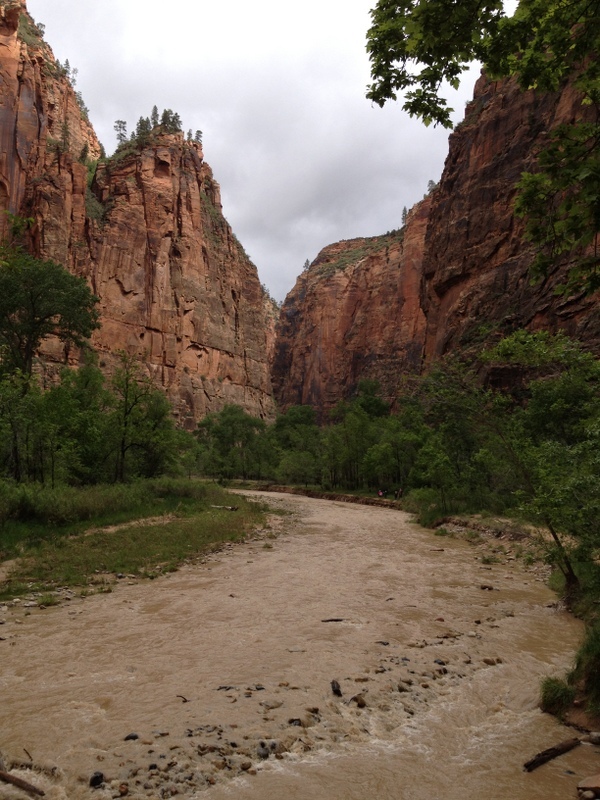 As we approached the river on a little trail along the side of the canyon, it started to rain a bit. It felt so lovely, since we were all wearing hats and had our pick of rock overhangs to duck under. I was carrying a backpack with both our laptops (we never want to leave them in the car), and Eric was carrying Micah, so we were kind of proud to make it to the end of the trail to see people setting off into The Narrows. Someday! It makes me shiver with joy to think of all the adventures that are ahead of us. After the hike back (and a sighting of a beautiful mule deer with his antlers in velvet), we boarded the shuttle and make a quick stop at Big Bend to see Angel’s Landing. We could just barely make out the tiny dots that were actually people winding along the precarious trail. 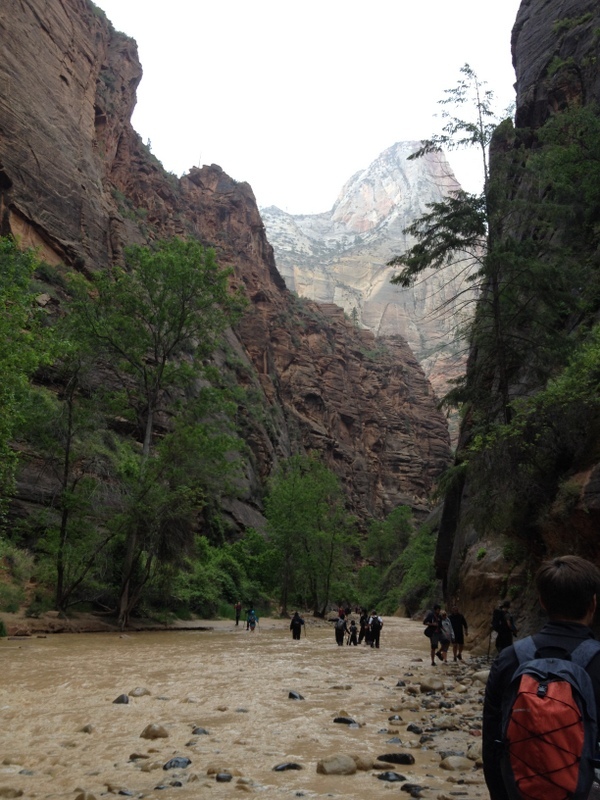 We would really have loved to have time to hike down to the Emerald Pools or even stay the night in the Zion Lodge (a historic lodge in a National Park?! This is more or less my dream vacation), but we had a five-hour drive to Green River ahead of us, so we had to hit the road just after lunch. Still, we were so happy to have seen the bit that we did. Visiting a place like this feels sacred to me, just as swimming in the ocean does. There is a powerful joy in experiencing this kind of beauty that I think is a deeply human thing. It makes me so grateful to be alive. How beautiful! I’m sorry I’ve never been there but looks like it is a must see. I want to stay at all the National Park Lodges…. if they’re nice. I kind of hate it when I can stay somewhere just long enough to whet my appetite, but a short visit is better than none at all. 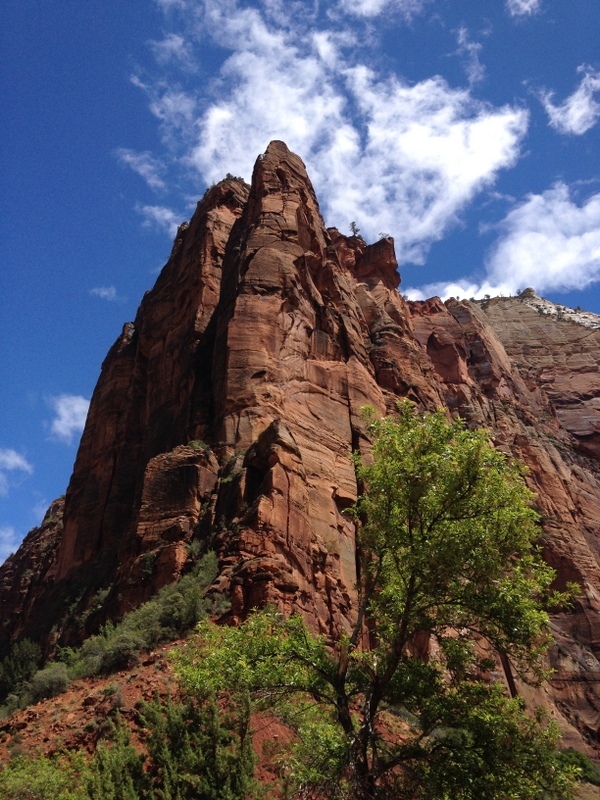 Zion is definitely on my list now. I was pleasantly surprised by the shuttles, too, the first time I went to Zion and I’m almost a little nervous to go in the off-season without one! Ha! The beauty of the canyon may distract me a little too much if we have to take our own car up and down the road 😉 I’m glad your family had a good time, it’s one of the easier parks to visit but also has a long of “bang for your buck” in terms of access to amazing spots along the way. Such pretty photos! It reminds me of our trip to the Grand Canyon (we stayed at a lodge on the rim, which was amazing. How crazy is it to wake up and *be* at the Grand Canyon?). Maybe one day we should all meet in the wilderness and stay at some gorgeous place and drink hot cocoa in front of an open fire when it inevitably gets chilly in the evening (really, it’s all about the people and the hot cocoa–not instant! Preferably the hot cocoa in Dorie’s Paris Sweets, which is frothed with an immersion blender!–in this fantasy. )….Things to dream of!